Looking for Festive Gift ideas? It’s always tricky finding someone the right gift, so here are some ideas! Don’t forget, you can get free postage on UK orders over £15 (excludes N Ireland). How about buying someone a Bible – or asking for a new one for yourself? We sell a range of New King James Versions and King James Bibles (Authorised Version) Bibles. What about a daily devotions book to help someone in 2019? We’ve got a range of daily readings titles here which are great for Christians. 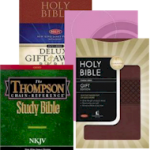 But also consider Bible Treasure booklets which are helpful for older children, teenagers or adults who have little or no knowledge of the Bible. How about gifts for children or teenagers? Looking for stocking fillers or bargains? We’ve got some great special offers here. Also see our Mayflower classics from just £1 and check out our second-hand section. Season’s greetings and best wishes to all from the bookshop team.